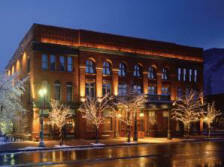 If you are a visitor to the ruggedly beautiful state of Colorado, plan a unique ghost-hunting adventure and stay at one of Colorado's historic haunted hotels. And if you are a resident of Colorado, get to know your state's spookier side and embark on an exploration of the unexplainable and visit one of Colorado's very own haunted hotels. 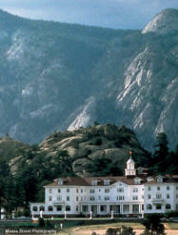 One of its most haunted hotel is the historic Stanley Hotel in Estes Park. Perhaps you might run into Stephen King there. Fortunately or unfortunately, you will not find crazy Jack Torrance there, unless it's really crazy Jack Nicholson on vacation from the Hollywood scene. 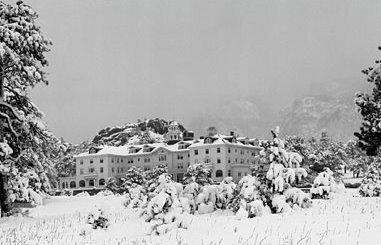 Seriously, if you really do want to get away from the rat race and enjoy clean mountain air, the amazingly beautiful Stanly Hotel is the perfect hotel. For ghost fans, this hotel is not as haunted as it is in the book/movie. Thank god. However, there are some known ghostly guests at The Stanley. The Stanley's original owners, Mr. and Mrs. Flora Stanley seem to have stayed on permanently to keep their present guests company. You may hear Mr. Stanley playing the piano in the music room. Or you may feel the presence of Mr. Stanley around the lobby or in his favorite place, the Billiard room. The entire fourth floor, formerly the old servant's quarters, is the hub of spirit activity, especially room 418. Sorry, not room 217! The sound of children playing in the narrow corridors of the Stanley's fourth floor can be heard, even when no children are present. An old Victorian landmark built in 1889, the Hotel Jerome is a very fancy, and very luxurious hotel located in the exclusive town of Aspen. The Hotel Jerome also happens to have a lot in common with another hotel, Jerome Grand Hotel located in Jerome, Arizona. They both share similar names and they both happen to share a history of ghosts. 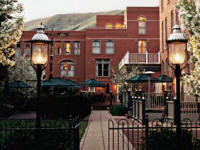 The eerie ghost story that haunts the Hotel Jerome involves the spirit of a young boy in room 310. It has been reported that a woman recently found a shivering and soaking wet boy in her hotel room, room 310. In the real world, that is not totally impossible, right? A lost boy somehow manages to get lost in your room at a hotel. It can happen. 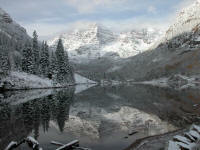 But hold on…..when a hotel staff person came to help, the boy had vanished, leaving wet footprints. However, no children happened to be registered at the hotel at the time. So who can this poor lost boy be? Legend has it that a child drowned in the hotel’s original swimming pool. Not surprisingly, room 310 is located right in the middle of an addition to the hotel that was built over that original pool. 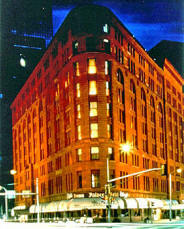 The Brown Palace Hotel is a well-known downtown Denver hotel – known for its historical value as well as its haunted nature. Over one hundred years old, the dignified Brown Palace Hotel has welcomed many US presidents, European royalty and even rock stars. Some of the ghosts consist of a few former employees and several guests who have decided to stick around – and their legendary hauntings would make any ghost story lover head for the Brown Palace immediately. One of their ghosts was a Denver socialite named Mrs. Louise Crawford Hill who actually lived in one of the hotel’s room – room 904 – from 1940 to 1955. Later, when the hotel began to offer tours, the hotel historian would include the life and heartbreaks of their old resident socialite. Oddly, the switchboard began receiving calls from room 904, only hearing static on the other end. Here is the real goosebumpy part: at the time of the calls, the room was under renovation. It had no telephone, furniture or lights. Once the historian removed the story about the socialite from the tours, the calls coming from room 904 stopped. 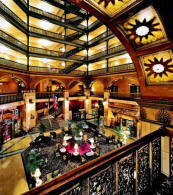 Another ghost at the Brown Palace Hotel is that of a man dressed in an old-fashioned train conductor’s uniform. An employee saw him at the United Airlines ticket office for a moment until he disappeared through the wall. Where that United Airlines ticket office stands today, was once a railroad ticket office. Another haunting is reminiscent of Stephen King’s The Shining. The hotel’s main dining room, Ellyngton’s, (rght) was once known as the San Marco Room, where big bands played. Eventually the San Marco Strings was the hotel’s main entertainment. One evening an employee heard strange sounds coming from the dining room, and went inside to check it out. He found a formally dressed string quartet practicing their music. Confused, he said to the musicians, “You’re not supposed to be in here,” only to hear their nonchalant reply, "Oh, don't worry about us. We live here." Several other hauntings include employees finding a former uniformed waiter in the service elevator, children running up and down the hallways, and the cries of a baby coming from the boiler room.